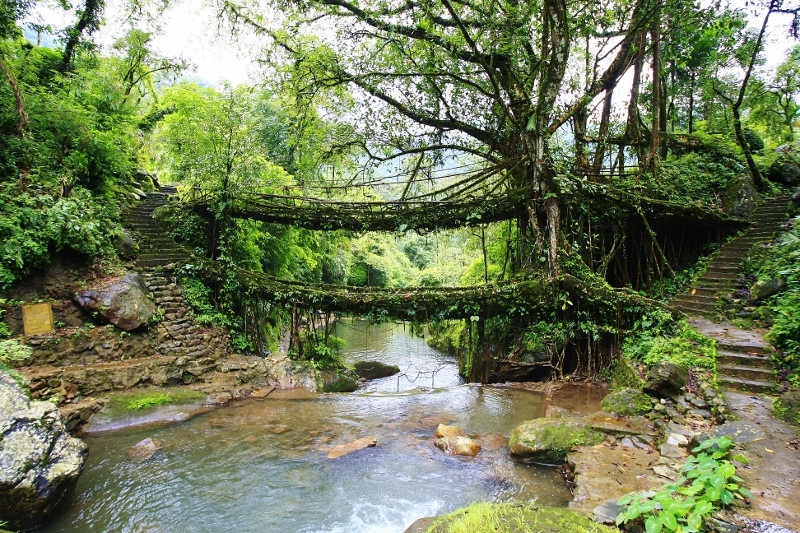 NatureStop: Double Decker Rootbridge,Cherrapunjee, Meghalaya,India. Common sense would suggest a bridge is built. Neither is this sense common nor are all bridges built. Some bridges are grown ! 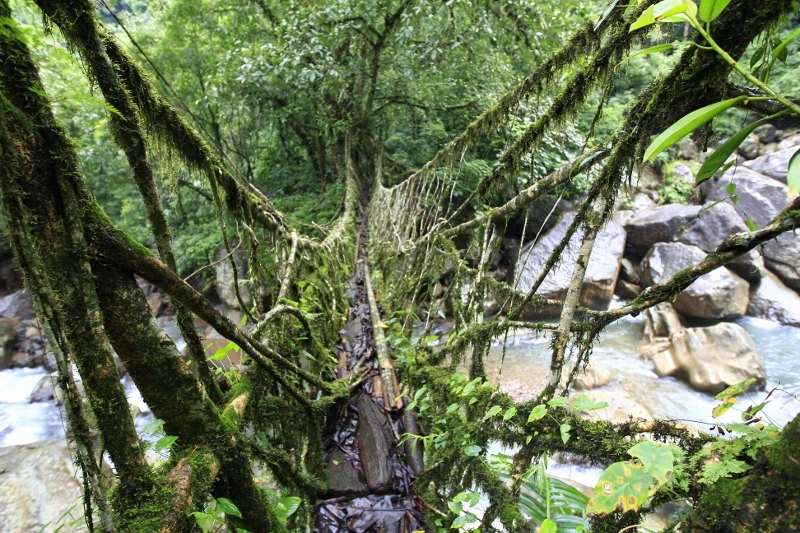 These are the root bridges of Cherrapunjee (one of the wettest places on earth). We wanted to do this trek together as a family but then we spoke to the Manager of the Cherrapunjee Resort he advised Arun to do the trek alone. It would be a 7 hour trek and since we were there in August in the monsoon season the trek would be a slippery one with approximately 3500 steep steps one way and 3500 way back…7000 steps and with two kids!! We agreed and I stayed behind with the kids while Arun packed lunch and with a guide set off at about 11a.m .We enjoyed the cloudy, foggy weather in the resort and after lunch went for a nap about 2:30p.m as we were sure that Arun would not be back before 5 p.m…was I surprised to see him back about 3p.m…and not sure if he made it to the bridge…what an experience he had…and he was walking like a penguin ...lol…this was what he had to say…. 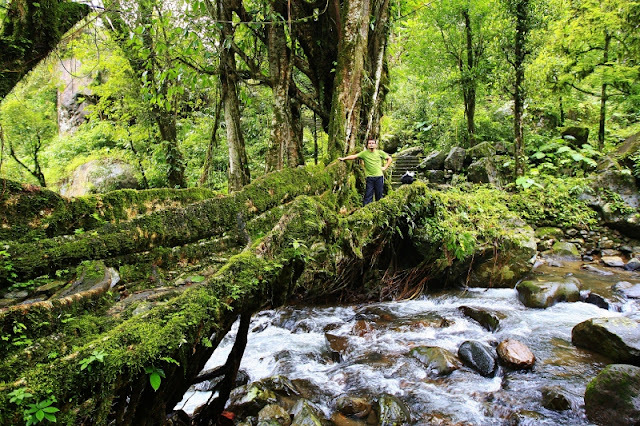 The War-Khasis, a tribe in Meghalaya, long ago noticed this rubber tree and saw in its powerful roots an opportunity to easily cross the area's many rivers. 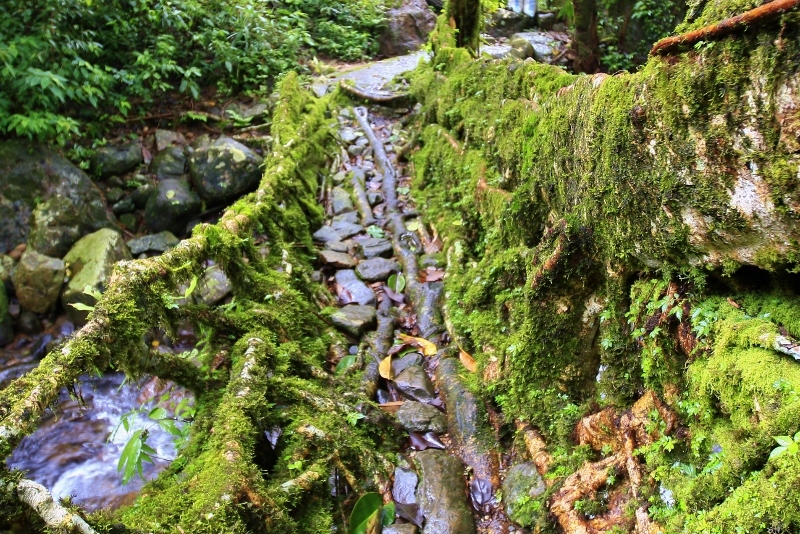 The living bridges are made from the roots of the(rubber ) Ficus elastica tree. This tree produces a series of secondary roots from higher up its trunk and can comfortably perch atop huge boulders along the riverbanks, or even in the middle of the rivers themselves. In order to make a rubber tree's roots grow in the right direction the Khasis use betel nut trunks, sliced down the middle and hollowed out, to create root-guidance systems. The thin, tender roots of the rubber tree, prevented from fanning out by the betel nut trunks, grow straight out. When they reach the other side of the river, they're allowed to take root in the soil. Given enough time, a sturdy, living bridge is produced. This is how slippery it gets...I realised my trekking shoes were no good, I invariably slipped with every step. Went Humpty Dumpty once! My guide was doing just fine with a pair rubber slippers. Placement of every step was a choice between loose rolling stones or a blanket of thick green moss. I was educated by my guide to fit you step between two stones. I was learning to walk yet again! 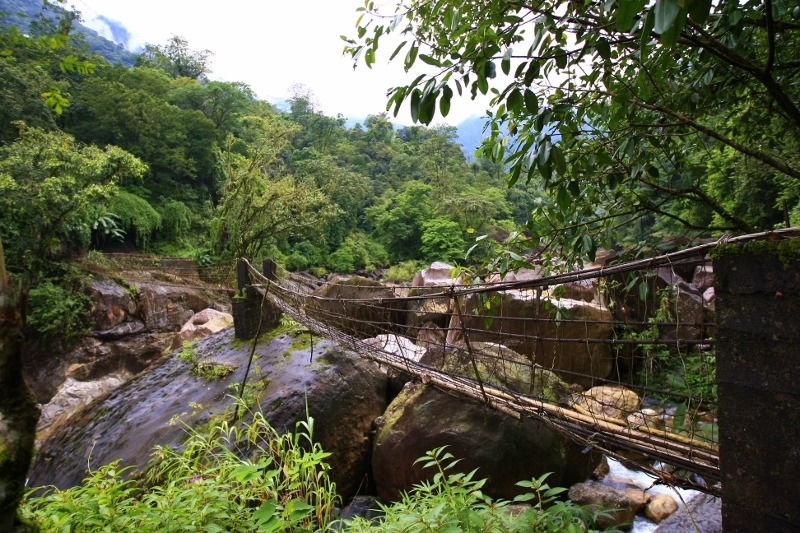 a steel wire hanging bridge as well..
Because they are alive and still growing, the bridges actually gain strength over time - and some of the ancient root bridges used daily by the people of the villages around Cherrapunji may be well over five hundred years old. 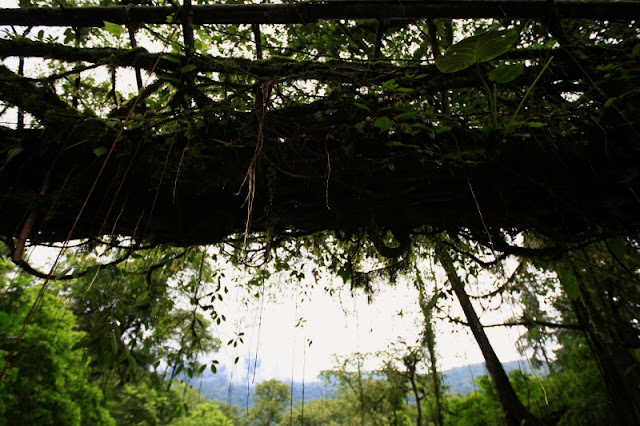 One special root bridge, believed to be the only one of its kind in the world, is actually two bridges stacked one over the other and has come to be known as the "Umshiang Double-Decker Root Bridge." Finally after another long trek of sweating, slipping, falling I finally made it to the Double-Decker Root Bridge..an achievement and lifetime experience indeed!! This is where we (self and our guide) had our packed lunch...this nature restaurant provided perfect ambience with live music (gushing water), natural spring water from the flowing stream and the view of the double decker bridge in front of me. Could there be better dining experience than this ? Though drenched in sweat and very low on energy, these did not matter, I was in a state of bliss. My earthly senses creeped back on me, reminded me to return back. I packed my camera...tasted the fresh sweet water and turned around. 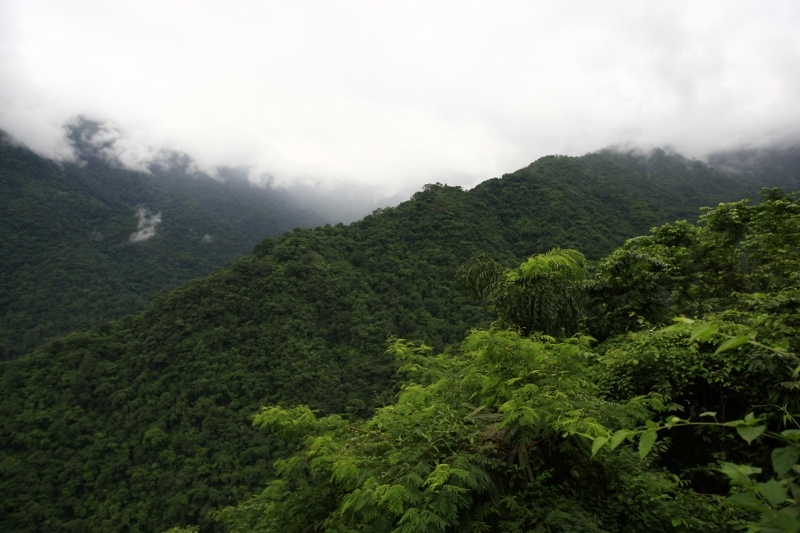 The very sight of being surrounded by mountains all around was indeed daunting. I asked my guide, if there was a shorter way up. He smiled and said "same way up". I could feel my energy level drop instantly. Mustered some courage and told myself "no way out, this has to be done". The trek back to the resort was with very low stamina even for further shots...you may notice there are no shots during my way back. Though I was really moved by the sight of an old man carrying a log of wood behind his back, as he climbed uphill with a smile. I did not have enough energy to even shoot a photograph. I was completely soaked in rain and sweat. For the first time in my life I took off my T shirt in public and climbed bare bodied. Rested after climbing every 10 steps. 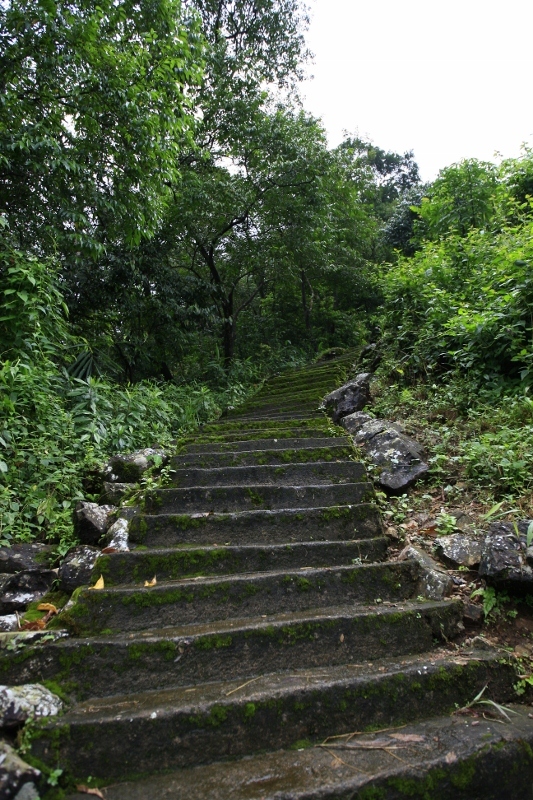 Finally, the never ending climb ended and I reached the top of the hill...Hats off to the people who live here and walk up and down this path daily as if it is only natural! 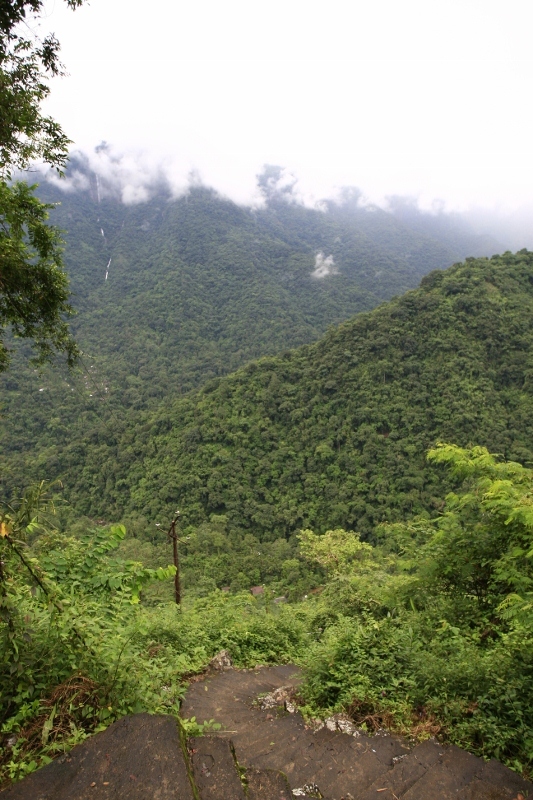 My guide asked me the time and found ourselves to have completed the entire trek in 3 hrs 45 mins . This was good as the average trek took 7 hours, I did this better not because I wanted to compete with others but because I just wanted to reach the top fast . I patted myself later ...a real test of fitness. Well worth the effort. Super pictures. That really is very green - and the bridge is a wonder! Wowwow! I missed it for the same reason - I went there with my baby. Thanks for sharing this!!! Oh my goodness!! How fortunate you consulted someone beforehand, I'm sure it would have been a nightmare with the children in tow. Wonderful photos! What a good job you took them on the way down Arun ;-) It certainly did look beautiful but I know that with my respiratory problems I would have found it completely impossible. my goodness arun and shantana, what an incredible post. i so enjoyed arun's writing and photography, they both make me feel as though i were there. yes, natures restaurant was magnificent, what a place this is. and how clever are those trees to make themselves into bridges?! the double one is fantastic. what an adventure! well done arun. wow! nice pictures! it's like I have been there and trekked with you! Thanks for sharing I really like the pictures..so verdant! Such beauty, looks like a wonderful place to be. Good for you having the stamina. 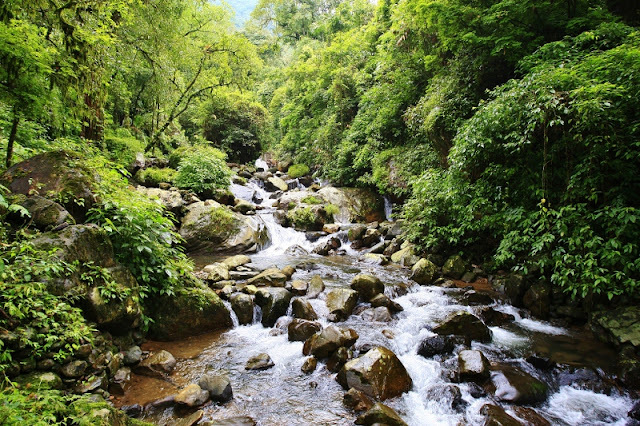 What a beautiful green landscape ! Wonderful pictures ...but hanging bridges frighten me! What a fantastic post. It was so well written that I felt I was there. Excellent pictures. Wow!! What a place and what an adventure you had! Amazing and beautiful. I thank you for sharing it with us. 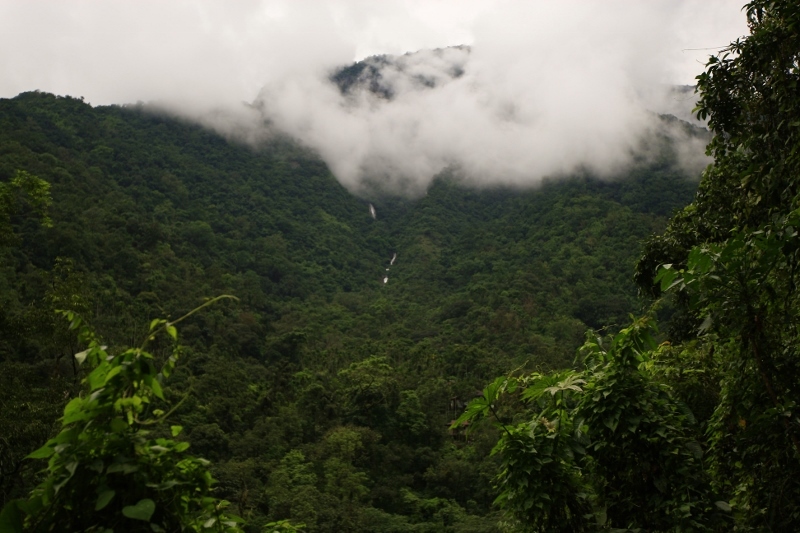 What a very difficult trek! The living bridges are amazing. Great photos. The mountains shrouded in clouds is so beautiful. What a gorgeous place for photography! This is a wonderful post and I thought the your photos were fantastic. Thank you for visiting my blog, I have enjoyed my visit here very much. 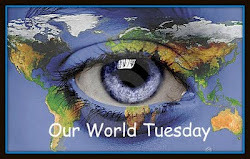 An amazing post...it is a good thing you and the kids didn't go though, my gosh! 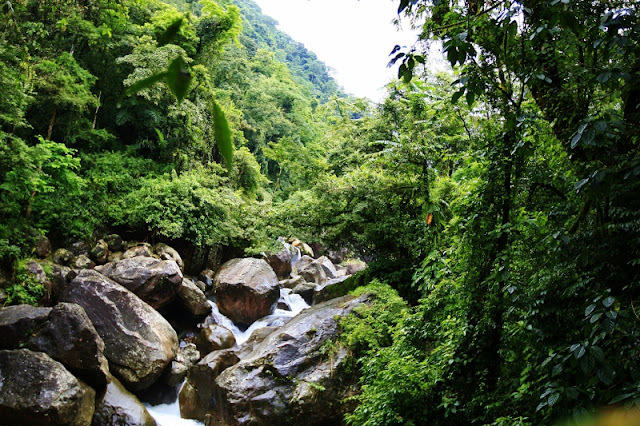 Thank you to your husband for sharing his fantastic pictures and descriptions of a place I'd never see (even if I should be so lucky as to be in the country, I'd never be able to do such a hike!). I hope you get to go someday though! Those bridges are incredible. wow! what a beautiful adventure!!! very lush and beautiful. mossy and humid! Fantastic photographs of the beautiful scenery. Everything is so green and healthy looking. 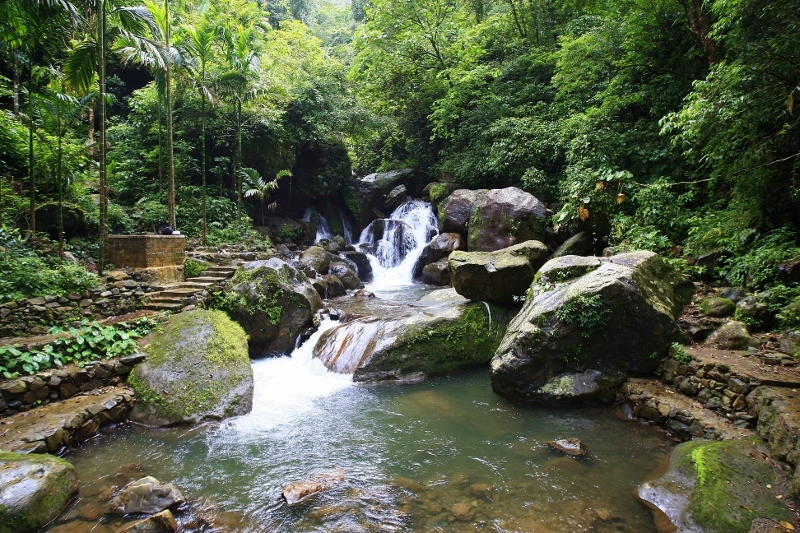 What a beautiful lush place, the greens are beautiful. Love the neat bridge. Great post and photos. I love the wet rocks and the waterfall and actually all the photos are incredible. The steps look a little slippery. I am enjoying your blog so much so will follow. Thanks for the virtual tour, it looks like a wonderful place! The waterfalls and little bridge are awesome. Wow! An amazing read with beautiful images!! WOW! Congrats on the trek! What an utterly beautiful place! Thanks for so much for sharing. Beautiful! Love the bridges... Well written - thanks for sharing! 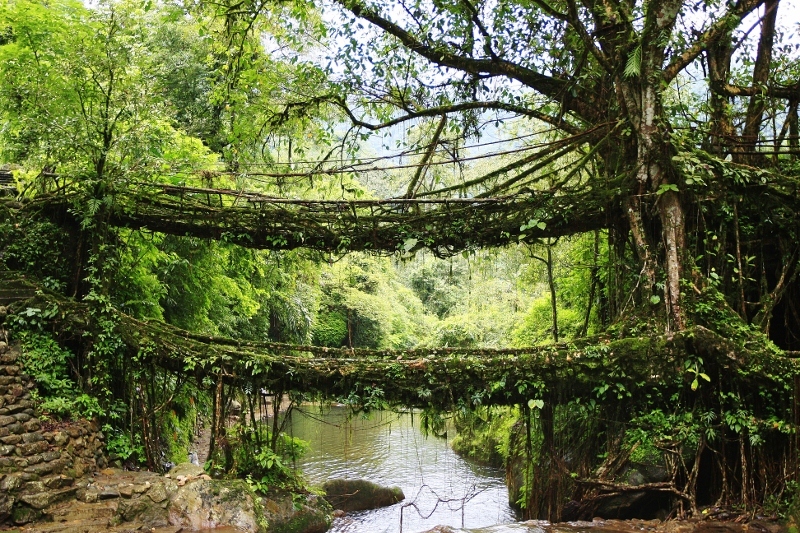 I have been hearing about these bridges and seen many pics...and I have made up my mind to visit when in Meghalaya for sure!!! A lovely rendition of the trek..as you have pointed out the difficulties in a nic eway too, it shows ur determination to visit the place!! Meghalaya is actually god's own country!!! I forgot. 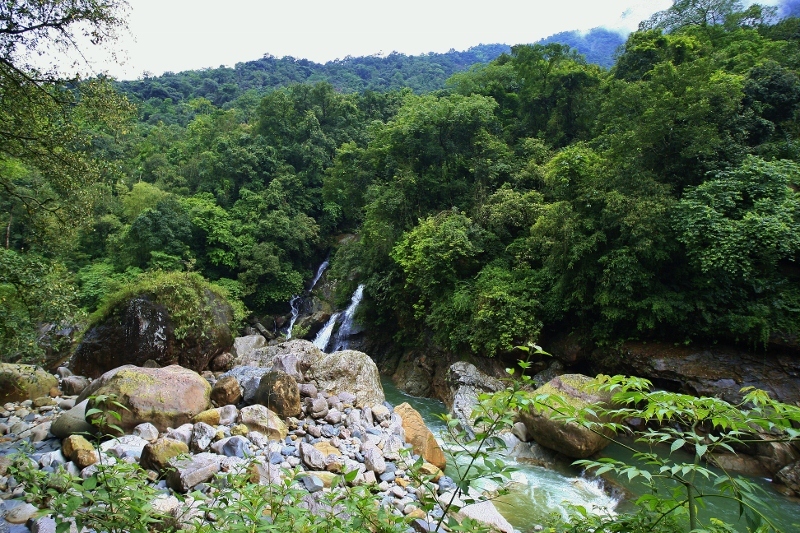 Thanks for explaining about the hanging bridges. Very interesting. The bridges are magic and so many steps. You did well! The nature is absolutely stunning and the water is my favourite music. Very interesting this place, every visit a great experience, an adventure for those Bow Bridge crossing! What lovely and lush scenery. Nice post with beautiful images. Thank you for sharing. Superb images, and I love the story. Ahhhh....nature at its best. You deserve that pat on the back! WHat a beautiful lush place. What a beautiful destination. Quite the workout, but worth it. What stunning photographs! I bet you’re glad your didn’t try that climb with two kids in tow. I will have to take another tour of your hike. Thanks for sharing this. Gorgeous pictures!! What an amazing place. What a wonderful experience! 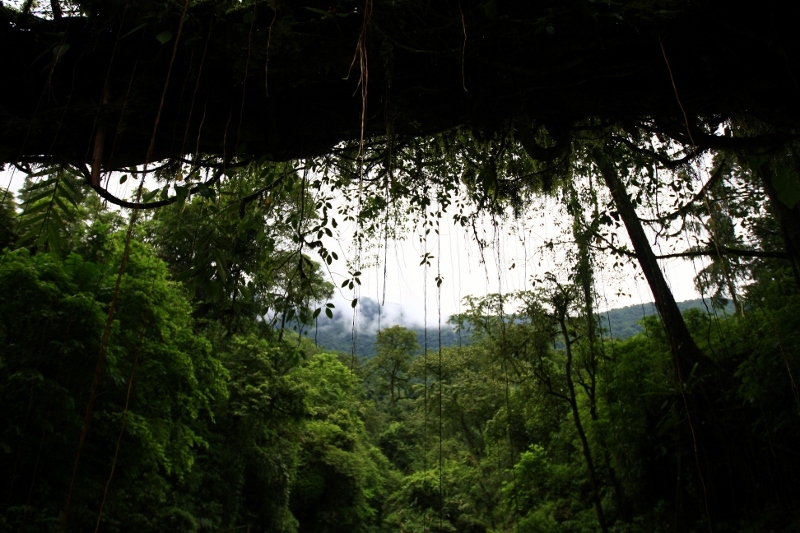 The root bridges are incredible. Spectacular shots! I don't know if I'd have the nerve to step on that bridge. a very interesting one of a kind root bridges. Wow, amazing pictures and interesting article! 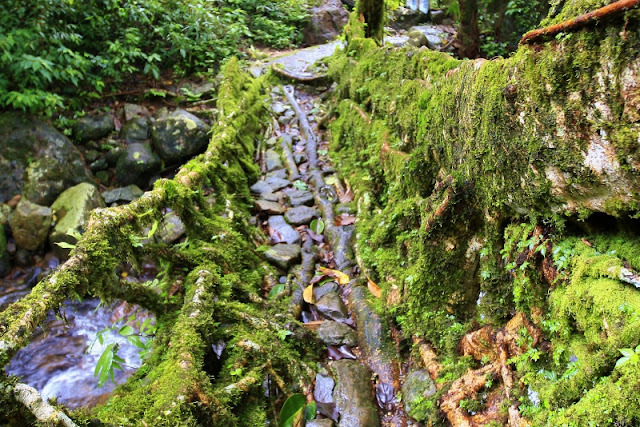 Wow, these root bridges are amazing. I had never heard of anything like this.The double decker one looks like something from a movie scene. You took gorgeous photos of nature, and the blue sky is so very blue! What an amazing looking place - and an amazing number of steps as well! Oh my goodness..how beautiful and how wise not to take the children. I could almost hear you breathing with the effort. :).. but worth it !!!... Michelle from Nature Notes. Great photos, and a quite fascinating post. Thanks for this. It's quite unique. Beautiful views and so lush! You must be in GREAT physical condition! Ruby, the photos are absolutely stunning!! Rugged and pristine. Kudos to Arun who went, clicked and lived to tell the tale. :) So that is what we miss when we don't venture out in the wild! I did the 'easiest' trek but that had me huffing and puffing on the way up while returning. Arun would have done that in a jiffy. The locals were of course carrying stuff in their baskets and holding umbrellas as well as they walked uphill as if they were walking on a straight and grassy pathway. The views of the double decker bridge and the sparkling waters are just amazing. So when/where are you guys heading next?? Wow---what an incredible place and hike... The photos are gorgeous... Looks like my kind of place --although I struggle with slippery areas.